Cyber Monday has become a popular phenomenon ever since Black Friday became a hit causing many people to go crazy shopping in a single day of the year. Quite quickly, the “Black Friday” fever took over the whole world, and Cyber Monday rode the wave along with it. So, today’s post is all about Cyber Monday email inspiration and why you should send such email campaigns to your subscribers. Cyber Mondays are the perfect opportunity to increase the effect of Black Friday’s campaigns but in the form of online shopping. While people are still in a shopping mood, you can realize even more sales. Moreover, having Black Friday campaigns and Cyber Monday email campaigns increases your brand awareness from which you can yield results all year long. Now, let’s see several great examples of Cyber Monday emails that will fuel you with ideas and help you boost your online sales when Cyber Monday comes. A great Cyber Monday email example by Taco Bell showing that brands in the food industry can fully leverage from Cyber Monday campaigns. Note that this email template doesn’t even have a button above the fold but it does have a dotted arrow prompting the viewer to scroll and see the offer. Here is a short Cyber Monday email by Casper using witty visuals boosting the effect of the message. “The Gift to Sleep” depicted by cute presents in the shape of Z-s. A focused message with a clear call-to-action button “Shop now”. Honestly, we love the idea of Cyber Monday being an extension of Black Friday because Black Friday causes quite a huge euphoria. 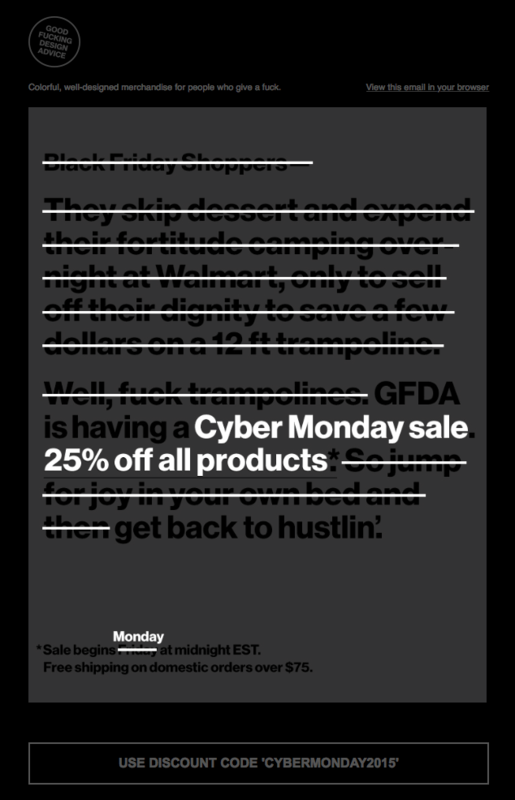 This Cyber Monday email template by GFDA is an ingenious example of how to make the connection between both campaigns. They simply scratched the Black Friday offer and overwrote the Cyber Monday offer. Another great idea is to simply merge both occasions into a several-day sale. 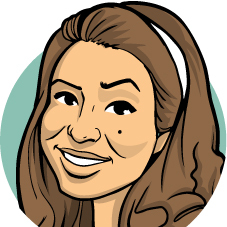 Here is what ReadyMag did. 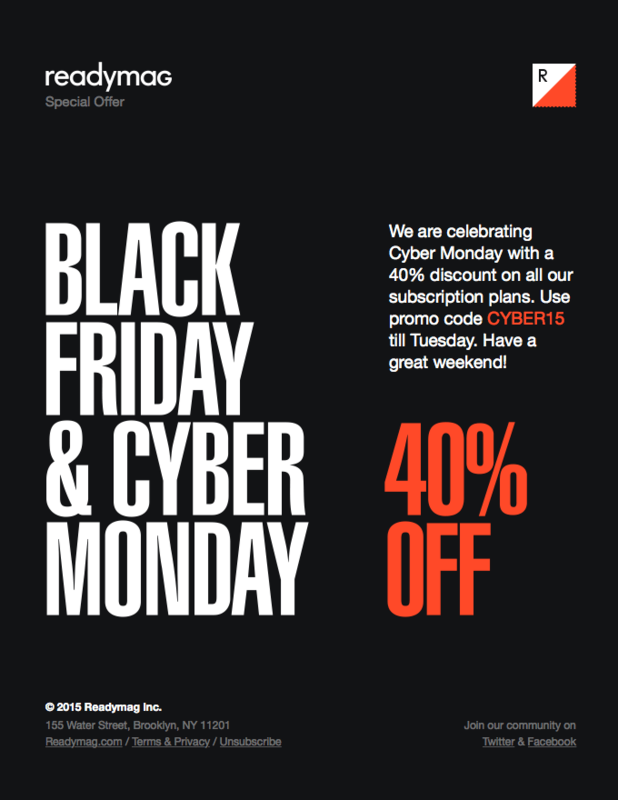 They combined Black Friday and Cyber Monday campaigns into a single one offering 40% discounts for a pre-set period of time. 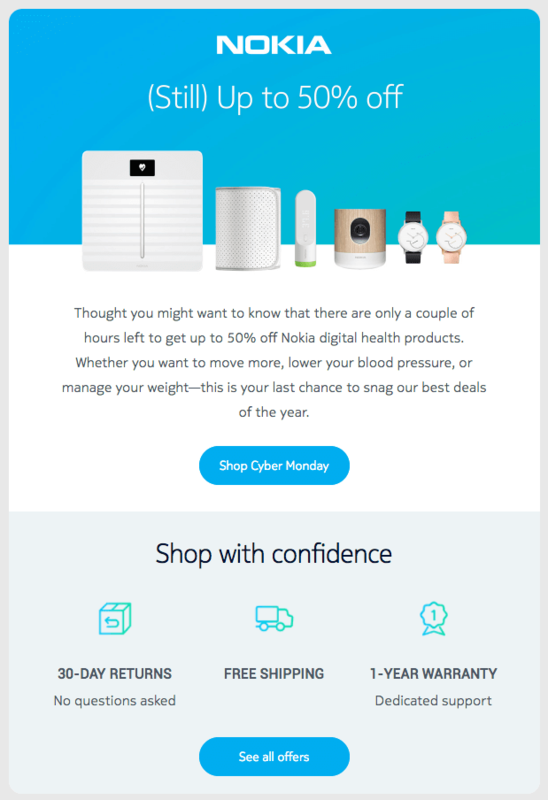 A nice and pleasant Cyber Monday email template by Nokia reminding their recipients that they can still take advantage of a 50% sale. If they scroll down, they will see a secondary call-to-action suggesting them to see all offers. You can test out different call-to-action copies like Nokia did, or repeat the same call-to-action to see what works better for your specific audience. The Cyber Monday fever brings the urgency factor alone but you can increase this feeling of urgency by using a countdown timer in your email template. See how DataCamp included such a timer in their Cyber Monday email. They also put the call-to-action button right after the timer, so the person can take action right away. 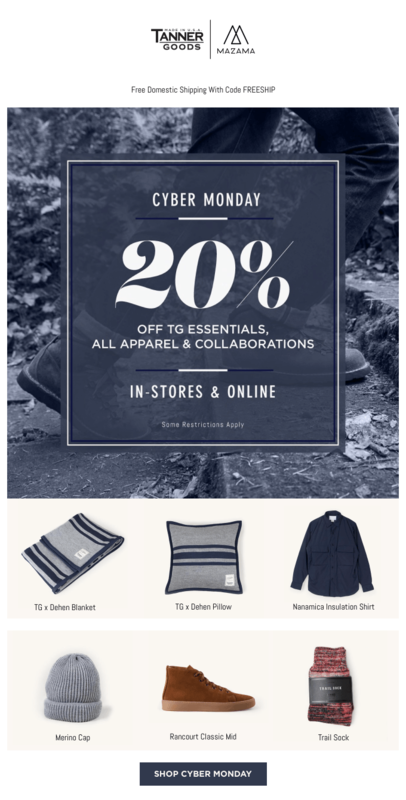 An example of a black-and-white minimalist Cyber Monday email by Herschel Supply Co. This one is a perfect example of “creating a hierarchy” by using a strategic placement of elements which lead the eye towards the call-to-action button. Here is another example of a countdown timer in a Cyber Monday email. 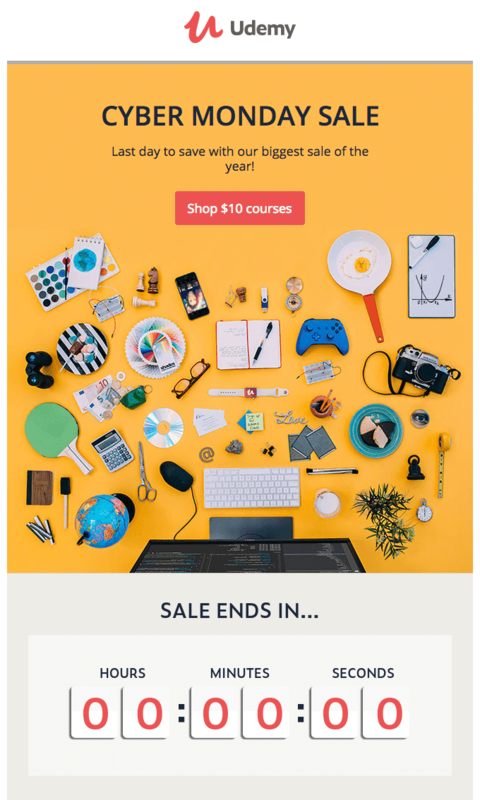 In this one by Udemy, the countdown timer is placed below the fold just to serve as an additional motivation if the user hasn’t clicked the call-to-action button above the fold. Here is an example of a Cyber Monday offer which is not limited to online sale only. Tanner Goods put a discount on both online and in-store products and gave a few suggestions to provoke the curiosity. 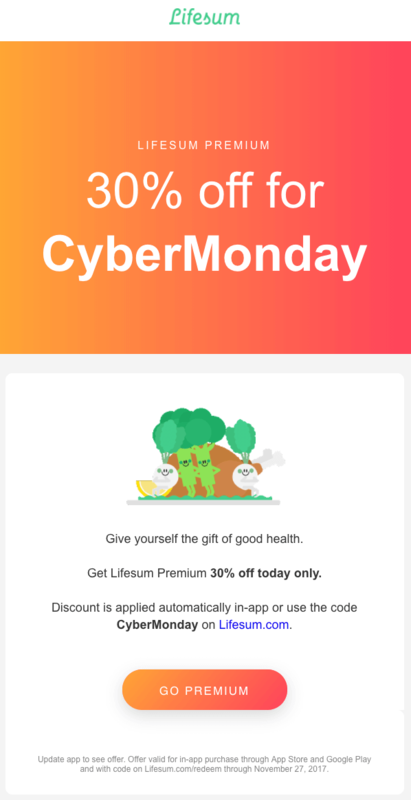 We love how the header gradient matches the button gradient on this Cyber Monday email example by Lifesum. This clearly speaks of consistency which is what you should strive for in all your email designs. Here is an example of a Cyber Monday email with more text by Super Team Deluxe. There is nothing bad to be more informative. Just make sure to make your copy scannable. E.g., Super Team Deluxe put in bold the important parts of the text. It’s important to be clear about what you are offering. We love how Electric Object put their main offer in the header section of the template, then repeated it in the main text, and then once again in the call-to-action button copy. 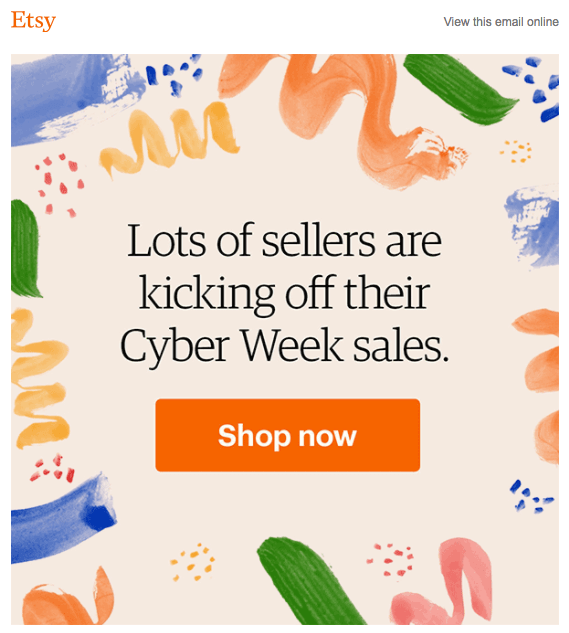 This Cyber Monday email template by Etsy is short and sweet. They really decided to keep it simple and focus on the call-to-action button while cheering up the mood with bright colors. Use the power of motion! Check out this Cyber Monday email example by Kate Spade. The brand used a simple GIF animation to recreate the effect of a neon light sign and certainly nailed the attention of the viewers. Ready to create a killer Cyber Monday email campaign? We sure are! 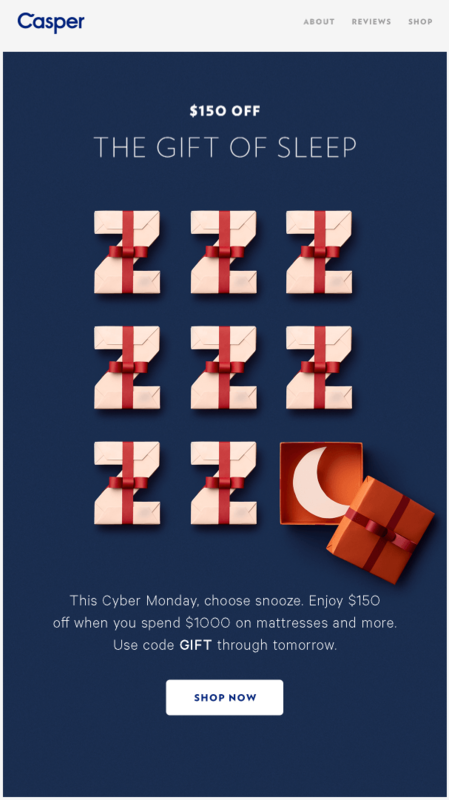 We hope these great examples of Cyber Monday emails got your creative juices flowing and you are about to create something amazing for the next Cyber Monday. If you’d like you can always share your thoughts in the comments below. Perhaps, you would like to check out some awesome Black Friday Email Examples for Maximum Inspiration?